Trollope’s lifelong involvement with Ireland produced several novels, all of which have come to be regarded as aberrations from the main course of his fiction. Indeed, one of the most fascinating aspects of the ‘chaos of criticism’ surrounding Trollope is the unwarranted neglect of his Irish stories. Apart from several reviews in his lifetime and scattered comments in surveys of his work, generally favourable, there is no adequate treatment of this area of his fiction. 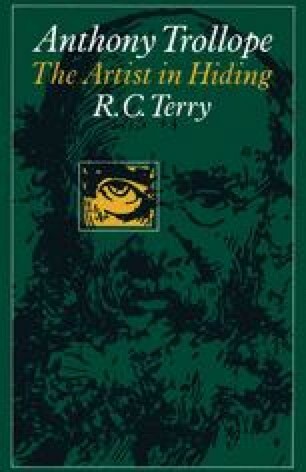 One article in recent years paid tribute to the first two novels, both failures in Trollope’s own day, but its very title — ‘Trollope’s Prentice Work’ (taking up a phrase of Sadleir’s) — betrays a quite unnecessary hesitancy.2 Yet his first novel, The Macdermots of Ballycloran, published by T. C. Newby in 1847 on the half-profits system, does in fact show that by this year Trollope had already arrived at competence in story-telling and characterisation. But to Sadleir it was a false dawn in his careers,3 as was his second novel, The Kellys and the O’Kellys, published by Henry Colburn in 1848. The other two Irish novels, Castle Richmond (Chapman & Hall, 1860), and The Landleaguers (Chatto & Windus, 1883), which Trollope left unfinished at his death, seemed to Sadleir scarcely novels at all, but documented pamphlets. This judgement is quite inadequate but has not been seriously challenged.